Army Sergeant Lyndon Sampang grew up in the Philippines before moving to Anchorage, Alaska, as a young adult. Feeling compelled to serve by the September 11 attacks, he joined the Alaska Army National Guard as an Infantryman and deployed during Operation Iraqi Freedom to secure the Iraqi-Kuwait border in 2006. In 2008 he went on active duty and deployed to Afghanistan with the 187th Infantry Regiment, 3rd Brigade, 101st Airborne Division at Ft. Campbell, K.Y. During that deployment, on March 18, 2010 in Paktika Province, the vehicle SGT Sampang was riding in was struck by a rocket-propelled grenade (RPG). He sustained severe injuries to his right leg and shrapnel in his left leg. His right leg was eventually amputated below the knee. Now medically retired, Lyndon works for the government. He also works out at CrossFit with his wife Cindy and enjoys spending time with their two children, Aniyah and Gabriel. 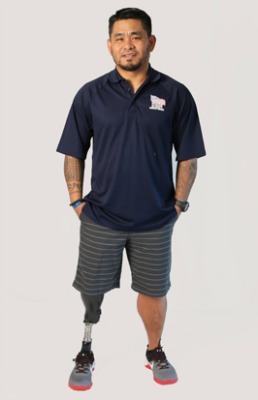 In the years since his injury, Lyndon has become an accomplished adaptive athlete. He hopes to become a certified fitness trainer and offer specialized workout assistance to others with similar injuries. It is when he returns home after a long day of working out, however, that Lyndon faced another set of obstacles. His previous home was located on a hill, which made it difficult for him to do outdoor activities with his children. The stairs to the second floor were problematic when he needed to tend to his children. His specially adapted custom home from Homes For Our Troops, built on one level with an open floor plan, resolves these issues for Lyndon. The accessibility and freedom he has in the home allow him to focus on staying physically fit and being an active member of his community. Lyndon chose to build his home in Gettysburg, Penn., for the community and its excellent school system. After the injury, Lyndon and Cindy say they started a new life, and receiving their forever home made it complete. “HFOT and its supporters are a miracle of God. Your generosity and kindness are greatly appreciated,” Lyndon says.